WOOBY LOVED HIS GOLDFISH WENDY AND HIS HUMBLE HOME. HE LIVED ON A QUIET STREET WHERE THE NEIGHBORS MINDED THEIR OWN BUSINESS. Wooby and Wendy are happily living in Dullsville until Peep, the new next-door neighbor, blows into town like a tropical storm. Peep is Wooby's opposite number. Her pet is Ricardo the iguana. Her lifestyle is loud and rowdy. "WOW, RICARDO! I HOPE THE NEIGHBORS WON'T MIND MY SOUND SYSTEM!" All the neighbors nix the event. Sheep says "Bah!" Panda has to practice Zen meditation. Kangaroo has a boxing match, and Cow remembers she has a moo-sic lesson. . Wooby wants to stay away from the par-tay, too, but he's too polite to take a pass and finds himself the unfortunate only guest at Peep's festivities. Peep tries to be the life of the party and winds up spilling Wendy's goldfish bowl, knocking down Wooby's 547-year-old shade tree, and, trying to make amends, she finally brings down the house--Wooby's house--all by herself. Oops. Not an auspicious start for a friendship, but two lonely people find a way in Cynthia Liu's Wooby & Peep: A Story of Unlikely Friendship (Sterling, 2013). 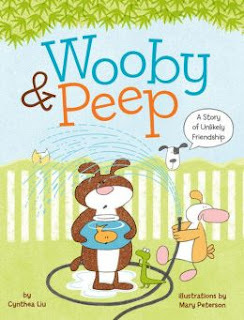 How Wooby and Peep become a "party of two" is a sweetly comic story that will charm kids completely, thanks in part to Mary Petersen's appropriately silly illustrations and Liu's light touch with her theme of friendship found in funny places. "Surprisingly affectionate," says Kirkus Reviews.